TRUE WALKOUT UNIT! Steps from the white sand beaches of Perdido Key, Florida! 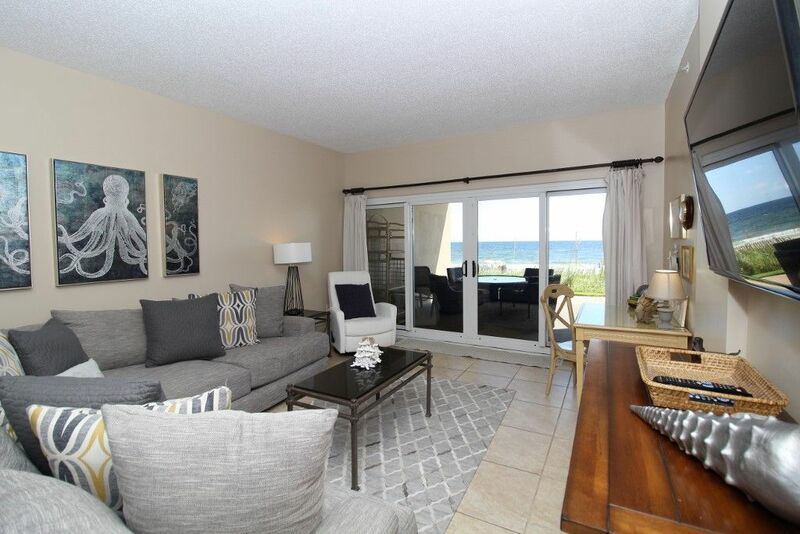 Exceed your own expectations and experience your dream vacation when you stay in this beautiful 2 bedroom, 2 bath beachfront unit at Sandy Key! Situated upon the shores of the Gulf of Mexico in Perdido Key, this ideally located complex combines luxury, comfort and pristine natural beauty into one perfect vacation destination! This spacious yet cozy Gulf front retreat boasts new designer furnishings, contemporary décor, updated electronics and appliances, and luxurious touches throughout. The living room offers plenty of seating including a huge L-shaped sectional sofa and additional cushioned chair, where the whole family can lounge and watch movies or their favorite show on the large flat-screen HDTV! There’s even a desk and high speed wifi for those of you who need to check the occasional email or work remotely. The living room is highlighted by the sliding glass doors leading out to the expansive beachfront patio, where you can wake up and sip your morning coffee while the sun rises over the Gulf of Mexico, or even enjoy an alfresco dinner under the stars while the tranquil sound of the waves relaxes your senses and calms your mind. Prepare a culinary masterpiece in the updated kitchen, boasting new appliances including a side by side fridge with in-door ice and water dispenser, oven with smooth cooktop, and all the small appliances, utensils and cookware needed to whip up a scrumptious meal and impress your family and friends! Retire after a long day of recreation to one of 2 luxuriously appointed bedrooms and catch some serious z’s on your Gulf Coast getaway! With premium mattress sets, high thread-count linens and posh bedding, you’re sure to enjoy quality rest and relaxation during your much-deserved beach getaway. Pamper yourself after a day on the beach in the master’s ensuite bath, complete with plenty of counter and cabinet space, fluffy 100% cotton oversize bath towel sets and deluxe bath amenities! Sandy Key boasts an abundance of recreation and amenities, including two Gulf front pools (one seasonally heated) outdoor hot tub, lighted tennis courts, state of the art fitness center and secure gated entry. An immaculate stretch of private beachfront is easily accessible with 2 beach boardwalks. Avoid the inconvenience of carrying beach items to and from the unit, with an exclusive personal storage area on the 1st floor. Enjoy the best seats in the house and indulge in a day of beach service, complete with two cushioned loungers and umbrella set up for a fee. The condo and location gave us everything we needed for a great vacation. Our condo unit was on the ground floor, but it was off the beaten path. We had almost no foot traffic between us and our ocean view. As for the floor plan, it was very spacious. There was plenty of room for privacy if needed, and my family of 6 had ample sleeping space for every person. We cooked most of our meals in the condo, and there were plenty of dishes and cookware to pull it all off. The condo management was great. The one issue we had with our toaster was solved immediately. The location was great for my young family. We have four daughters age 10 and under. Alcohol is prohibited on the private beach, so we didn’t have to deal with obnoxious partying. The beach was not overcrowded either. And by the way, the white sugar sand is beautiful on the Gulf. There were some great local restaurants as well, so we weren’t disappointed in our few meals away from the condo. All in all it was a great vacation. Thanks! We loved our stay at Sandy Key and particularily enjoyed our unit which was on the ground floor and on the end of the property so it was very quiet! The unit was very clean and nicely appointed! We are so glad that you enjoyed your stay, Elsa! We would love to have you stay with us again. Really beautiful condo, right on the ground floor and right on the beach. Fully stocked with everything you could possibly need. We were there in January so did not use the pools but we did use the hot tub and it was nice although it could have been hotter. Everything was very clean and the instructions they sent us prior to our arrival were very clear and easy to understand. Very spacious, two bedrooms, two baths, three tv's. Thank you for your positive feedback! We are happy to know that you enjoyed your vacation and the condo. We hope to see you again soon! Quiet, relaxing, quiet, beautiful view, quiet, great dining close by, quiet, nice condo !!! Did I say “quiet” ? We are so happy to hear that you enjoyed your stay! Thank you for submitting this review. We look forward to having you stay with us again soon! Beautiful, comfortable condo on the beach! This is a wonderful unit. It's a walk out first level condo with parking right in front of the building. It is beautifully furnished and very comfortable. The views for drinking coffee in the morning or wine in the evening are spectacular. Thank you for providing feedback about your recent visit with Luxury Coastal Vacations! We are ecstatic to hear your stay was enjoyable and the unit met your needs, and we appreciate you taking the time to share your thoughts and experiences with us! The condo was just as beautiful as shown in the pictures. The view is fantastic. We were very comfortable and had a great time. We were located close to great restaurants; but since we were close to the end of the complex, it was very quiet. Loved the heated pool as well. We also enjoyed reading about the history of the condo in the guest book. Thank you Betty! We love to hear you enjoyed your time here on the key and checked out some of our local restaurants! We hope to see you again!